Booked this hostel when our original one screwed us over - they went above and beyond to be accommodating to us. You can't beat the location - spend $1 or $2 more and stay in the central city instead of outside - you'll save a ton on metro fees. Stairs are scary and dangerous AF but it's well worth it. Tucked away in a great location. Staff was friendly, beds were very comfy, and I was quite happy with my stay and the price. Room was very clean, too. Only stayed for a day and had an overall nice stay. The location is SUPERB, right off some of the best restaurants by the Dam Square. Kind of hard to go up the stairs if you have a lot of luggage, but just fine for me and my partner as we each only had a backpack. Met some really great people in my room. Room and bathrooms were both clean and spacious. The bathroom and shower was clean and more like what you might find in a hotel room. The room itself was also big and clean, but there was a lack of outlets near each bed. Phones had to be charged by the door, which wasn't convenient. There was no common area to speak of so don't expect an atmosphere if you want to meet other travelers. For the price, however, it's not a bad option if you want something conveniently located near the central station. Also, those stairs are brutal. 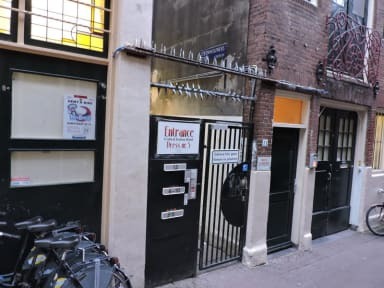 Great Location right near Dam Square and De Wallen. Perfect for getting around to sight see and enjoy the night life. 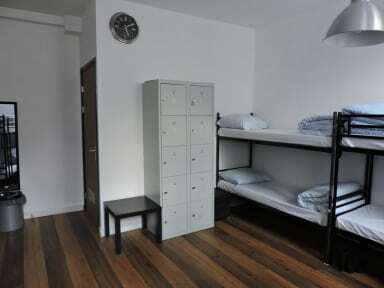 Rather good hostel. Location is very good. My bed was not clean but even expensive hotels are not cleaning bed sheets neither. Prices can be lowered little bit. Was perfect for a short stay but no space to hang out with friends so not much of an atmosphere. Everything was clean and tidy and the staff were nice! There is no kitchen in the Hostel.